The Infrared Slim Body Wrap is a safe, affordable, healthful method for you to detoxify, and help achieve your weight loss goals. You can expect to be relaxed and see visibly tightened skin in a few sessions of just 60 minutes each. This infrared slim body wrap involves wrapping the body in soft warm body wraps with several exclusive infrared heating elements. As this safe infrared energy penetrates, it heats the tissues and increases the blood supply within the affected area, promoting the mobilization of accumulated tissue waste. The infrared slim body wrap targets the areas of the body where you might be focusing your slimming and fitness routine. It works great for both teens, men and women! The FIR Jacket and Trousers each have its own a control box, and each control box has two connections, to power one half (one side) of the body wrap. 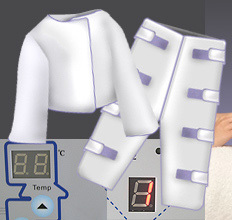 These separate zone controls for jacket and trousers let you apply thermal infrared waves to upper or lower body, each with its own separate time and temperature controls. Operates on the same principles and with some design elements similar to the German Infrared Wrap system distributed world-wide and known as "Formostar". That system is widely used in spas and salons, where the charge is usually from $60-80 and up for a one-hour session. To buy the system requires an investment of 10,000 dollars. The FIR Jacket, the FIR Trousers, or the complete Jacket/Trousers set, are affordable enough to have them in your own home, and benefit from this great space-age technology at your own convenience. This is simply unbeatable. • The Infrared Slim Body Wrap has two components, Slim Body Wrap Trousers PH-2C and Slim Body Wrap Jacket PH-2J, and each has an individual control box to adjust separately. They must be connected correctly before use. • The Infrared Slim Body Wrap has flexible construction; 1 size fits all. You can use slimming trousers and slimming jacket separately or together. Loosen the connecting strips (Trousers: 8 strips; Jacket: 3 strips) on either side of the Wrap, put it on, reconnect the strips properly. You should wear undergarments when being wrapped. Bring a change of undergarments because those you are wrapped in will become wet. The best position for use lying down, or else standing, keeping the wraps straight and flat. Insert connecting plugs A, B ( Figure 1) to the A, B jacks on the back of the control box. There is a semicircular gap on the top of the connecting plugs A and B. When you insert the connecting plug, keep the semicircular gap up. When you switch the power switch on the back of control box to ON, the power indicator on the front of the box will light up. Press the ON/OFF button on the front of the control box. The Temperature LED will display: 42°C, the Time LED will display: 40 Min (Figure 2). These are the default settings. Press Start/Stop button on the front of the control box to start the Slim Body Wrap working and heating. Important: If you press the Start/Stop button On, but indicators A / B, or both, still do not light up, stop use immediately and check that the connections A / B are connected properly. If the Overload indicator comes ON, stop using the Wrap immediately. (0-90Min.) The Temperature Up and Down buttons will adjust temperature (30°C~60°C). Note: indicators A and B indicate 2 channels or connections, one for each side of the garment (wrap). Each side has a separate connection, but the settings apply to both sides (channels) simultaneously. Press Start/Stop to discontinue operating, then press ON/OFF button to turn OFF, finally, switch the power switch OFF on the back of the control box. 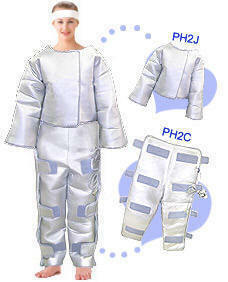 Take off the infrared slim body wrap, turn it inside out and allow 10~30 Min. for temperature to lower. Store it in a dry, dark place. 65 x 115(cm) / 25.6" x 45.3"
65 x 155(cm) / 25.6" x 62"
15.4" x 16.9" x 9.4"